If you are looking to get into off-road biking, probably through the woods, through the desert, or on any rough terrain, then going for a mountain bike is the best decision for you. Mountain bikes come in various types, and from several manufacturers but they are all designed to navigate rugged and rough terrains. The main elements that vary in the various types of mountain bikes are the frame geometry (with a major focus on both the head, and the seat geometry), the suspension design, as well as the amount of suspension travel, and other contemporary elements such as the handles bars, breaks, and gears. Mountain bikes are typically designed with a stout and upright frame to get over logs and rocky terrain without causing discomfort to the rider. They are designed to withstand the harsh environment, ensuring the bike remains as effective as when you bought it. Individuals who take riding as a way of life, tend to own about 2 to 3 different mountain bikes, possessing distinct but negligible differences with respect to the discipline it mainly is used for. While others could own just one or two of these mountain bikes to satisfy their needs. Choosing the perfect mountain bike may depend on several factors, among which includes its major purpose i.e. where are you going to be riding it, and your set budget. Unlike the other types of bikes, most, if not all mountain bikes, come with a built-in suspension which basically helps the bike maintain traction on ascent and descent, absorb forces and shocks generated from the rough terrain, and swiftly roll over uneven grounds. 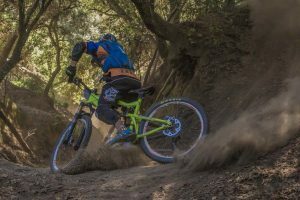 Types of mountain bikes include cross-country bikes; trail bikes; all-purpose bikes, and DH bikes which are perfect for downhill riding, as well as tackling major hindrances such as rock gardens, jumps, and drops. Take Away: Be sure to know the type of terrain you will be navigating before making a final decision on a bike. And possibly test out the bike on that terrain.